I am sure for many of us kids of the 80s (showing my age now!) that the word “quiche” conjures up unpleasant memories of very beige looking creations with strips of fatty ham and a thick and soggy pastry casing….. so I’m pleased to tell you that I’ve given this childhood picnic staple a makeover and present this remixed high protein, nutrient packed version that makes a great dinner and an even better lunch the next day. Not only that, but you can customise the filling to fit your needs and macros. How do you make this vitamin-filled vegetarian version? Read on! Pre-heat oven to 180c. Peel and chop the butternut squash so that it is in small cubes or thin slices. Arrange on a baking tray, drizzle the coconut oil over the top and add a generous pinch of Himalayan pink salt before baking in the oven for approx 20 minutes (do not allow to burn). After 20 minutes, or when the squash is starting to soften, add the broccoli florets and stir well, making sure they are coated in the coconut oil. If the mixture seems quite dry, feel free to drizzle a little more oil over the broccoli. Put back into the oven for around 5 minutes – again, do not allow the broccoli to burn (this can happen quite quickly so keep an eye on the oven). Remove from the oven and set aside. In a bowl, beat the eggs, followed by the quark and milk, mixing well to get rid of any lumps. Add the chopped herbs and seasoning before stirring in the cooked vegetables, making sure everything has combined well. Pour the mixture into a tart tin (a cake tin will do the job just as well) and put back into the oven for 15-20 minutes. Once you can see the top is set but there is a slight wobble in the middle then remove from the oven, top with the grated cheese and put back into the heat for 5-10 minutes until the surface is golden and bubbling. Remove from the heat, cut, serve and enjoy! As you can see, I served mine with a baby kale salad, but any kind of leaves would work. 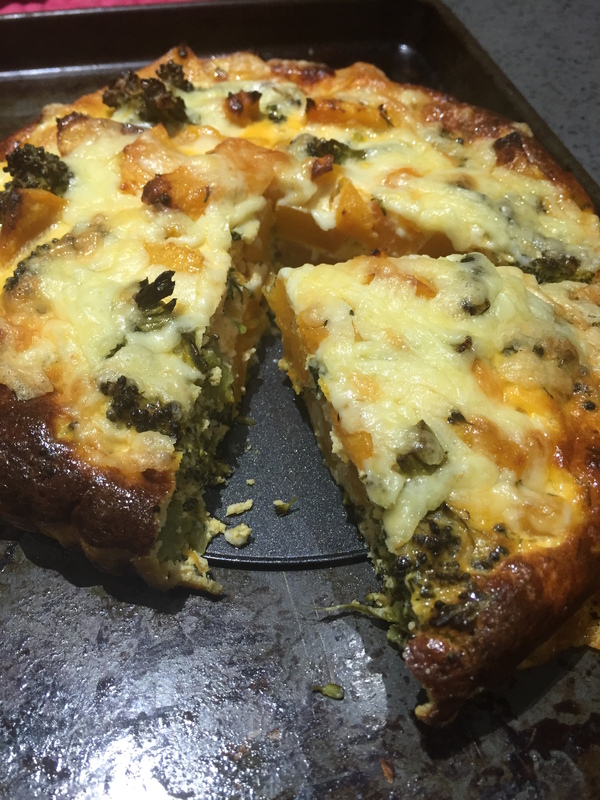 Once completely cooled then the quiche can be stored in the fridge for 3-4 days and a slice of this with salad would make the perfect lunch – no soggy pastry bottom in sight! 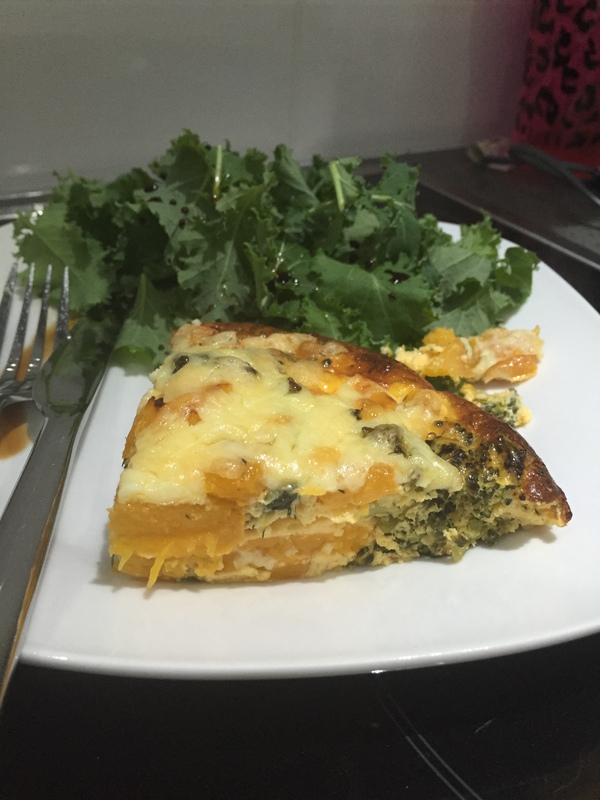 As I mentioned at the start, you can customise this recipe to fit your own needs and macros. If you need to up tho protein content then you could add salmon or lean bacon, or you could use other vegetables in season such as asparagus or peas. Get creative, and if you make this yourself please tag me in your photos – I love seeing you guys using my recipes!